Why is there this switch as it were, a shift in focus from our relationship with Jesus to our relationship with one another? He knew if He asked us to just love Him that would be easy. He asked us to love each other! He knew that was another story!! The test of our love for Him is in our obedience to this command; to love each other. Remember this is a few hours before his arrest. He knew what was ahead and that they were going to need each other in the new chapter in their faith. They could not be in competition with each other nor in constant comparison. He wanted them to know the importance of being connected to Him first. It is from that prime connection that they get their identity and not from each other or in relation to each other. Nor do they get it from what they do or don’t do. You can almost sense the urgency in Jesus’ voice as HE is trying to get this truth across to a very distracted lot of disciples. Jesus knew that this would not produce the fruit He was looking for in their lives. Did this prompt the Master to wash the feet of His disciples as an object lesson so that they would never forget? He could see what had the potential to destroy the early church – pushing for power, position, and prominence. He had to get them to understand that that would get them nowhere. It would not produce the fruit He was looking for. To paraphrase chapters 13 to 16. “ Hey, guys stop all this fighting amongst your selves. Stop secretly thinking about how you can get forward and leave the others behind. It does not work that way. Jealousy and competition and grabbing won’t get you anywhere. You need it each other. Trust me, it is going to get crazier than you think. The politicians and religious rules are going to come after you. Some of you will pay with your life. You need to watch each other’s backs. You will not be able to do the stuff I want you to do if you do not stay close to each other and me. It’s just like the grapevine and the branches. They are connected. If it is not, it will die and not bear any fruit. I want you guys to succeed. I am giving you the Holy Spirit for that reason. I will be praying for you. Your unity is so important. More than you can ever imagine. Trust me, this will only work if you get it together. I love you deeply. Just like my dad loves me. I love each of you. See I do not treat you like servants. We are friends. All of us.Together. Do you get it? Together! Its not going to work any other way. Not one of you is more important than the other. Get rid of that thinking. It will destroy you. When you do this, people will realize that you have been with me and this is something powerful. Intrinsically linked to our fruitfulness is our loving one another. 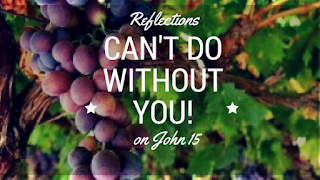 Jesus deliberately intertwines the vine and branches. He knows of our tendencies towards self-glory and independence that He worked it in a way where we can’t do without each other. Jesus is dealing with Core issues here. 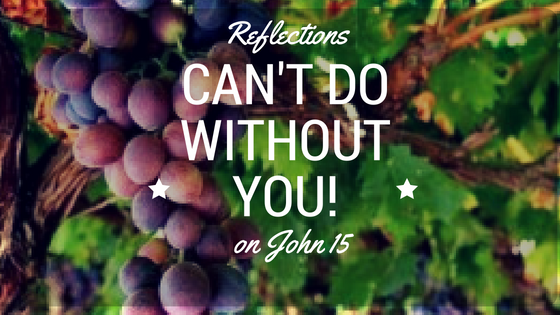 He knows that we cannot do the above until we have understood this vital truth. That is, who we are – branches connected to the vine. We are to be ones connected to Jesus Himself, getting our identity from Him not in a slavish way. He calls us friends. He establishes my worth. But as if this is not enough. He establishes WHOSE we are. He establishes my belonging and my connection. When this is settled, we are able to love one another to the point of death, to the point to preferring others, thinking of them more highly than ourselves, to the point where it does not matter who gets the credit or the attention. ( Phil 2:2-4). For by the grace given to me I say to everyone among you not to think of himself more highly than he ought to think, but to think with sober judgment, each according to the measure of faith that God has assigned. 4 For as in one body we have many members,[e] and the members do not all have the same function, 5 so we, though many, are one body in Christ, and individually members one of another. Romans 12:3-5. You see this as a recurring them even through the epistles. Paul is constantly asking the believers to live in love and unity. When this happens, we will bear lasting fruit (verse16). We can have many kinds of fruit in our lives. Jesus is looking for one particular kind – the lasting kind. What I get from this passage is that it all about my relationship with Jesus and the other branches – my fellow Christ followers. It’s not about keeping a set of rules and regulations. As I said earlier the Pharisees were very good at it. It was cold and calculated to the last dill and cumin. Love was something they did not understand. They understood religious rituals and not a relationship, which was always in the heart of God; that we would desire Him deeply. Hence, they misunderstood Jesus. They never understood his compassion that caused him to smash Sabbath rules to heal the cripple. Religion can snuff out and replace relationship so subtly that we can fail to recognize this shift in our hearts. We need the Holy Spirit, to help keep us in check, and connected. As I crossed the 50 mark, I have become more and more aware that I want the second half of my life to count even more. I want to make an impact, leave a legacy, and change the culture around me to reflect more of more of His Kingdom here on earth as it is in heaven. As I end my reflections I am more convinced than ever that being connected to the vine is not about “spiritual disciplines” ( and there is a place for that) but rather my relationship with Jesus and each other. As Paul eloquently puts it If I have not love, I am nothing!!! (1Cor 13:2). I do not want to be just hot air and a lot of noise with no substance. I want to love and serve and have fruit that will last.